By Mary P. Pringle and Clara A. Urann. And other gods, with Thor supreme among them." As early as two thousand years before Christ Yule-tide was celebrated by the Aryans. They were sun-worshipers and believed the sun was born each morning, rode across the upper world, and sank into his grave at night. Day after day, as the sun's power diminished, these primitive people feared that he would eventually be overcome by darkness and forced to remain in the under world. When, therefore, after many months, he apparently wheeled about and grew stronger and stronger, they felt that he had been born again. So it came about that at Hweolor-tid, "the turning-time," there was great rejoicing at the annual re-birth of the sun. In the myths and legends of these, our Indo-European ancestors, we find the origin of many of the Yule-tide customs now in vogue. According to the Younger Edda, Wodin or Odin, the pioneer of the North, a descendant of Saturn, fled out of Asia. Going through Russia to Saxland (Germany), he conquered that country and left one of his sons as ruler. Then he visited Frankland, Jutland, Sweden, and Norway and established each one of his many sons on a throne. This pioneer traveler figures under nearly two hundred different names, and so it is difficult to follow him in his wanderings. As Wodin, he established throughout the northern nations many of the observances and customs common to the people of the Northland to-day. The Edda gives an ancient account of Balder, the sun-god, who was slain because of the jealousy of Loki (fire). Loki knew that everything in nature except the mistletoe had promised not to injure the great god Balder. So he searched for the mistletoe until he found it growing on an oak-tree "on the eastern slope of Valhalla." He cut it off and returned to the place where the gods were amusing themselves by using Balder as a target, hurling stones and darts, and trying to strike him with their battle-axes. But all these weapons were harmless. Then Loki, giving the twig of mistletoe to the blind god, Höder, directed his hand and induced him to throw it. When the mistletoe struck Balder it pierced him through and through and he fell lifeless. 'Gainst that alone had Balder's life no charm." Great excitement prevailed among the assembled gods and goddesses when Balder was struck dead and sank into Hel, and they would have slain the god of darkness had it not occurred during their peace-stead, which was never to be desecrated by deeds of violence. The season was supposed to be one of peace on earth and good-will to man. This is generally attributed to the injunction of the angels who sang at the birth of Christ, but according to a much older story the idea of peace and good-will at Yule-tide was taught centuries before Christ. According to the Edda, gifts from the gods and goddesses were laid on Balder's bier and he, in turn, sent gifts back from the realm of darkness into which he had fallen. However, it probably is from the Roman Saturnalia that the free exchange of presents and the spirit of revelry have been derived. The Druids held the mistletoe in great reverence because of its mysterious birth. When the first new growth was discovered it was gathered by the white-robed priests, who cut it from the main bough with a golden sickle never used for any other purpose. The food peculiar to this season of rejoicing has retained many features of the feasting recorded among the earlier people. The boar made his appearance in mythological circles when one was offered as a gift to Frey, god of rain, sunshine, and the fruits of the earth. This boar was a remarkable animal; he could run faster than a horse, through the air and over water. Darkness could not overtake him, for he was symbolical of the sun, his golden bristles typifying the sun's rays. At one time the boar was believed to be emblematical of golden grain, as he was the first to teach mankind the art of plowing. Because of this service he was most revered by our mythological ancestors. In an account of a feast given in Valhalla to the dead heroes of many battles, Saehrimnir, a sacred boar, was served. Huge pieces were apportioned to the deceased heroes and the meat had such a revivifying effect that, restored to life, they called for arms and began to fight their battles over again. An abundance of heavenly mead made from goats' milk and honey was provided for the feasts and on occasions ale, too, was served. 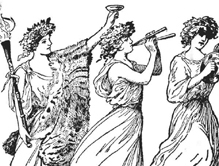 Toasts were usually drunk in honor of Bragi, god of poetry, eloquence, and song. 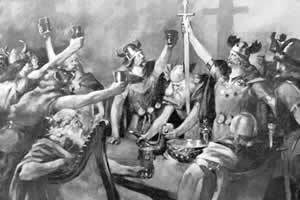 The gods pledged themselves to perform remarkable deeds of courage and valor as they tossed off horn after horn of mead and ale. Each time their mighty valor grew until there was no limit set to their attainments. It is possible that their boastful pledges may have given rise to the term, to brag. Apples were the favorite fruit, as they prevented the approach of age and kept the gods and goddesses perpetually young and vigorous. Certainly Yule-tide was a very merry season among the ancient people who feasted, drank, and danced in honor of the return of the sun, the god of light and new life. When messengers went through the various countries bearing tidings of a new religion and of the birth of a Son who brought light and new life into the whole world, they endeavored to retain as many of the established customs as possible, but gave to the old-time festivals a finer character and significance. As the fact of Christ's birth was not recorded and there was no certainty as to its date, the early Christian Fathers very wisely ascribed it to Yule-tide, changing the occasion from the birthday of the sun to that of the Son. For a while the birth of Christ was celebrated on dates varying from the first to the sixth of January; on the dates of certain religious festivals such as the Jewish Passover or the Feast of Tabernacles; but the twenty-fifth of December, the birthday of the sun, was ever the favorite date. Pope Julius, who reigned from 337 to 352 A. D., after a careful investigation, considered it settled beyond doubt that Christ was born on or about the twenty-fifth of December, and by the end of the fifth century that date was very generally accepted by Christians. The transition from the old to the new significance of Yule-tide was brought about so quietly and naturally that it made no great impression on the mind of the masses, so nothing authentic can be learned of the early observance of Christmas. The holly, laurel, mistletoe, and other greens used by the Druids still served as decorations of the season, not as a shelter for fairies, as in former days, but as emblems of resurrection and of immortal hope. The glorious luminary of day, whether known as Balder, Baal, Sol, or any other of the innumerable names by which it was called by the primitive peoples, still gladdens the hearts of mortals at Yule-tide by "turning-back" as of old; only to-day it yields its place to a Superior Power, in whose honor Yule-tide is observed. All Christendom owes a debt of gratitude to its pagan forbears for the pleasant features of many of its holidays and especially for those of Yule-tide. The Fathers of the early church showed rare wisdom in retaining the customs of these ante-Christian festivals, imbuing them with the spirit of the new faith and making them emblematic of a purer love and hope. New Year's Day as a feast day is one of the oldest, if not the oldest, on record. It is mentioned by Tacitus in the First Century, but first referred to as a Christian festival about the year 567. In Rome the day was dedicated by Numa to the honor of god Janus, for whom Julius Cæsar named the month of January. Numa ordained that it should be observed as a day of good-humor and good-fellowship. All grudges and hard feelings were to be forgotten. Sacrifices of cake, wine, and incense were to be made to the two-faced god who looked forward and backward. Men of letters, mechanics, and others were expected to give to the god the best they had to offer of their respective arts. It was the great occasion of the entire year, as it is now in many countries. The date of New Year's Day has varied among different nations. Among the Egyptians, Chinese, Jews, and Romans it has been observed on dates varying from March first to December twenty-fifth. It was as late as the Sixteenth Century before the date of January first was universally accepted as the New Year by the Romans. Nations retaining the Gregorian calendar, such as Russia and Greece, observe it thirteen days later than those who reckon time by the Julian calendar. Among northern nations the love of fire and light originated the custom of kindling bonfires to burn out the old year and destroy all evil connected with its past. Light has long been an expression of joy and gladness among all branches of the Aryan race. The Greek and Latin Churches still term Christmas the "Feast of Lights," and make it a period of brilliancy in Church and home. The Protestant covers the Christmas tree with lighted candles and builds a glowing fire on the hearth. The innate love of light and warmth—the inheritance from the sun-worshipers of ages past—is always dominant in humanity at Yule-tide festivals. Some service in a real compliment." The King that gave Christianity to Norway. And this shall be thy reward." This is taken from Yuletide in Many Lands.